A 3D rendering shows Saturn with its moon, Titan. Photo credit: shutterstock.com. The quest for the existence of extra-terrestrial life has been a topic of priority for astrobiologists ever since Galileo Galilei invented the telescope in the 16th century. Scientists from all around the world from Stephen Hawking to Carl Sagan agree that life is not exclusive to the earth, according to the mediocrity principle as well as the Copernican Principle. To establish the validity of these two principles astronomers have sent space probes to other planets in the Solar System and have also built enormous telescopes around the world and even in space (Hubble Telescope). According to Space, Astrobiologists are now focused on the moons of the giant gas planets particularly Saturn and Jupiter. 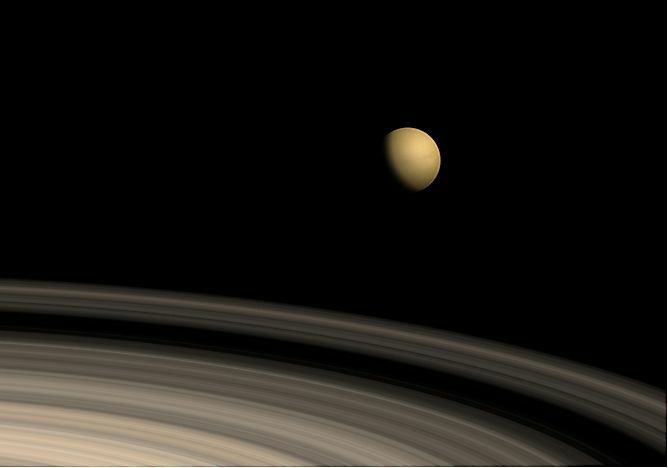 One of the moons that was considered as a perfect candidate to have some form of life is one of Saturn’s moons known as Titan. The moon is the only one of its kind in the solar system with an atmosphere. However, life is not expected to be as we know it as conditions in Titan are far from the conditions expected in an ideal habitable planet or moon. The surface temperature on Titan is estimated to be negative 179.2 degrees Celsius. NASA’s space probe orbiting Saturn, Cassini showed the presence of vast seas, on Titan’s surface made up of ethane and methane. In a report on online Astronomy magazine, Sarah Horst from the University of Arizona did an experiment where she applied energy to a combination of the gases similar to that found in Titan’ atmosphere which resulted in the production of amino acids (building blocks of protein) as well as nucleotide bases (building blocks of DNA and RNA). Another such experiment was conducted by NASA in 2013 where scientists concluded that organic chemicals could be present in Titan. Cassini also gave hints of the presence of vinyl cyanide, an organic hydrocarbon in Titan’s atmosphere but this was never confirmed, until now. A report published in the Science Advances journal on July 28th, 2017 confirmed the presence of the hydrocarbon in Titan’s atmosphere after the extensive analysis was done on data collected in 2014 from the Chile-based Atacama Large Millimeter Array (ALMA). The data also showed that one cubic centimeter of liquid from Titan’s seas contain as much as 10 million membranes, a significant figure compared to the 1 million bacteria contained in one cubic centimeter of water from earth’s oceans. Cassini also showed the presence of negatively charged ions or anions on Titan which could be another clue in the quest of extraterrestrial life on the moon. In a report published on July 26th, 2017 in The Astrophysical Journal Letters, scientists believe these were the same ions which led to the rise of life on earth.